I'm going back to the first game that I ever owned. I had played Basic D&D several years prior, but had never actually owned that game myself. Rather, my brother taught me the rules and the neighbor friends owned the rules. I'd like to relearn the SF rules, in order of how they were made. 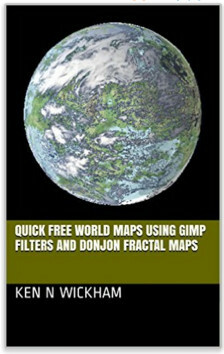 My goal is to begin with the Star Frontiers Alpha Dawn Basic book, and work my way little-by-little through the series just for fun. When I had bought it back then, I only was able to play the basic stuff and began to play the Crash on Volturnus module before I bought MERP and switched my gaming to it. 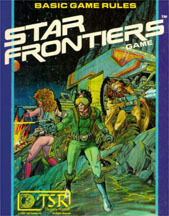 Star Frontiers is once available again. Also there are Star Frontiersman and Frontier Explorer downloadable magazines which has carried on the game through to the more recent years. I'll begin with the original books. I like seeing the quick start stuff in the original, which teaches the basics first - so I will do that again. So I will begin back where I started and see if the game means something different than it did when I was very young. A quick summary setting up this game, the setting of this game is the center of the Milky Way Galaxy. There are two other species that the humans come into contact. The Vrusk (Insect like) and the Dralasites - which the Vrusk found a few years ago. The Vrusk send information to the humans teaching them the basic technology for rapid space travel. They meet in a section of the space called the Frontier and find the Yazirians (a gliding monkey like species) . The Pan-Galactic corporation forms to supply to the needs of the new mixed species worlds. And then the Sathar (survivors describe as worm-like species) appear from somewhere and destroy settlements on the edge of the Frontier. The four races form the United Planitary Federation (UPF) which have the Star Law Rangers aimed at taking down Sathar Agents which have been hired by the Sathar to cause trouble and sabotage. With this, I'll try making a character for a solo game. I'll try making a human at first just to get to know the universe from a human perspective first. However, I seem to find myself likening the scifi races compared to fantasy core races. Vrusk = halfling, both love art and music and are shorter than humans (Vrusk are under 5' tall and 5' long insectoids. I've copied the expanded character sheet below and filled out the amounts as I read the character creation for the Basic game. 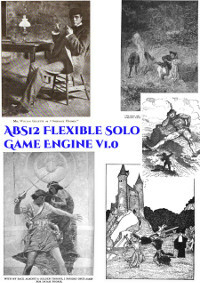 Several slots are not yet used and I imagine will be used in the Expanded version of the game. Along with the character creation, the Basic game mentions some basic rules. Here is my summary. Initiative is by sides rather than individuals. Roll 1d10 plus highest initiative. Reroll every turn. Monorails take 1turn to arrive. They move 10 spaces per turn. 1 credit per day. Skimmers move 10 spaces, reduce to 7 before corner, stop, but 5 spaces after corners. 10 credits per day rent. Dexterity, chance of hitting target. Must have sight and range. Find range, subtract from Dexterity to find chance to hit. If on moving skimmer or running -10. A roll of 01 to 05 always hits as long as in range and in sight. Grenades bounce if they miss. Roll less than or equal to chance of hitting to hit. If hit, roll for damage for that type of weapon xd10. Reloading takes one full turn. 1 credit per hit point. Temporary 10 hit points for 3 hours from Stimdose. Roll Personality score or less for favorable reaction. With that, I am ready for the Adventure included in the Basic game. I may have to modify the game slightly since I will be soloing the game. In the next post in the series, I plan on beginning the Basic adventure.